One of Calgary’s oldest and most iconic neighbourhoods is set to get a new lease on life. 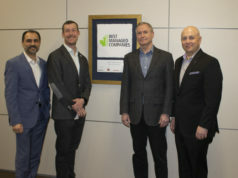 Victoria Park – the inner-city neighbourhood and home to the Calgary Stampede and the Scotiabank Saddledome – is the latest focus of Calgary Municipal Land Corporation (CMLC), the organization responsible for the redevelopment of the East Village. CMLC’s vision for the neighbourhood is centred around the idea of a cultural and entertainment district in the east end. It will be Calgary’s first master-planned downtown district. To facilitate the CMLC’s vision for Victoria Park, it is committing approximately $150 million into infrastructure and placemaking initiatives. These will include extending 17th avenue SE into/through Stampede Park, completing another stage of RiverWalk, extending the Cycle Tracks program and developing streetscapes and development opportunity around the Green Line LRT line. The City of Calgary currently has a $3 billion capital plan and has resolved to focus infrastructure investments on three key areas, one of which is a cultural and entertainment district. CMLC’s first step in the transformation of Victoria Park has been to create a Master Plan. Last October, it issued an RFP to select a Design Collaborative and Master Planning Team. Following a selection process, it selected Mark Johnson of Denver-based Civitas and Stephen Mahler of Calgary’s Gibbs Gage Architects. “The Master Plan vision we develop for Victoria Park will honour and integrate previous and future plans and projects, including Calgary Stampede’s envisioned expansion, the City’s quest for a viable site for a new arena facility, the Green Line extension of Calgary’s LRT and, of course, the East Village Master Plan,” says Mark Johnson, President of Civitas. The Master Planning Team will get started now, with a view to delivering the Master Plan vision by June. Input from community stakeholders and citizens will be sought, and citizens can share their visions for Victoria Park’s future at calgarymlc.ca/riversdistrictmasterplan.